Roundhay Park in Leeds, West Yorkshire, England, is one of the biggest city parks in Europe. It has more than 700 acres (2.8 km2) of parkland, lakes, woodland and gardens which are owned by Leeds City Council. The park is one of the most popular attractions in Leeds, nearly a million people visit each year. It is situated on the north-east edge of the city, bordered by the suburb of Roundhay to the west, Oakwood to the south and the A6120 outer ring road to the north. In the 11th century William the Conqueror granted the lands on which the park stands to Ilbert De Lacy for his support in the Harrying of the North in the winter 1069–70. De Lacy, who founded Pontefract Castle, was a knight from Normandy. During the 13th century, the area was used as a hunting park for the De Lacys who were the Lords of Bowland on the Yorkshire-Lancaster border. Ownership of Roundhay passed through succession to John of Gaunt and then to his son, Henry IV. In the 16th century Henry VIII gave the park (though not the manor) to Thomas Darcy. Through succession and marriage, it was acquired by Charles Stourton, XV Baron Stourton (1702–1753) in the 18th century. In 1803, Charles Stourton's nephew, another Charles Stourton, XVII Baron Stourton (1752–1816), sold the estate to Thomas Nicholson and Samuel Elam. Nicholson took the northern part which became Roundhay Park. Thomas Nicholson's land had the remains of quarries and coal mines. He disguised these former industrial areas by constructing the Upper Lake and the Waterloo Lake. The mansion house was built between 1811 and 1826 with a view over the Upper Lake. Nicholson constructed a castle folly. The Nicholson family was responsible for building the Church of St John, almshouses and a school on the south side of the park. After Thomas Nicholson's death in 1821, the estate passed to his half-brother Stephen. In 1858, his nephew William Nicholson Nicholson inherited the land on the death of his uncle. In 1871 Roundhay Park was put up for sale. It was purchased for £139,000 by a group including the Mayor of Leeds, John Barran. Leeds City Council was unable to buy such a large tract of land without an Act of Parliament, which was obtained on 21 June 1871. The local authority agreed to pay the same price and gave the estate to the people of Leeds as a public park. Leeds architect, George Corson, won the competition for landscaping Roundhay Park. Some parts of the estate were then sold for building plots to offset the cost to the council and Barran. Prince Arthur officially re-opened the park in 1872 in front of 100,000 people. In 1891 the first public electric tram with overhead power (trolley system) in Britain was inaugurated linking Roundhay Park with Leeds city centre 3 miles (4.8 km) away. The tram terminus is now a car park but some of the trolley poles remain. A record crowd of 80,000 watched a rugby league sevens match between England and Australia in the park in 1933, won 29–11 by Australia. At the south end of Waterloo Lake is a dam, in 1907 an open-air swimming pool was constructed below it, it was known as a lido and was particularly popular in the 1950s but was closed and filled in during the 1980s. The area is now a car park, still signposted 'Lido'. In June 2005, two teenagers drowned in Waterloo Lake: a memorial stone on the lakeside footpath recalls their memory. In January 2007, the Lakeside Café was extensively damaged by fire. Following complete renovation including a new roof, it has reopened. Canal Gardens, separated by Street Lane from the main area of the park, contains Tropical World, a series of temperature-controlled glasshouses representing different climates from around the world. It holds the largest collection of tropical plants in the UK after Kew Gardens. The main building, Coronation House, is named from the original 1911 building, the year of the coronation of George V. The present construction was built in 1939 and modernised in 1983, re-opening as Tropical World. In July 2008 it was renamed The Arnold and Marjorie Ziff Tropical World. Arnold Ziff gave £30,000 towards its launch. Tropical World has a butterfly house and aquariums. Exhibits include birds and some reptiles living free inside, and many other animals in enclosures including a group of meerkats. Its nocturnal house is home to creatures such as bats which are active at night. In 2015 following further refurbishment and alterations an Aztec zone opened in area transformed into an Amazon themed zone occupied by piranhas and salamanders. The three main parts to Canal Gardens are a grassed area with mature trees, flower gardens along a rectangular lake 350 feet (107 m) by 34 feet (10 m) dating from 1833 which resembles part of a canal, and a walled garden built c. 1816 as a vegetable garden for the Mansion House which contains a collection of roses, and provides the entrance to Tropical World. The Canal Gardens are to the west of the main area of the park, separated from it by Prince's Avenue. This is a path leading to the Alhambra garden, planted 1999 based on Claude Monet's garden at Giverny (1902). It leads north from Mansion Lane, to the north of the main area of the park. This is an area with a central rectangular pond with fountains, inspired by a similar water feature at the Generalife in the Alhambra in Granada, Spain. It is to the north of Mansion Lane, north of the main area of the park. The Friends Garden (meaning the Friends of Roundhay Park) is a secluded one off the rose garden of Canal Gardens. There are gardens for blind people with scented plants and braille inscriptions. Thomas Nicholson had planned to make a third lake in a hollow which is now the Arena, but he died before doing so. In 1894, it was converted into a sports arena with cycle track, providing work for unemployed people in Leeds. It is overlooked by a mound known as Hill 60, which was so named to commemorate Leeds soldiers who died in First World War battles around Hill 60 near Ypres. It can hold over 100,000 people. This was the location of large concerts by The Rolling Stones, Michael Jackson, Simple Minds, Bruce Springsteen & The E Street Band, Madonna, Level 42, Genesis, Robbie Williams, U2 & Cast, among others. In the summer, it is used as a cricket pitch. A folly built in 1811 by local master builder George Nettleton to give the appearance of a castle gate. It originally had a wooden roof and an upper room, and was used as a summerhouse, a sewing room for the Nicholson girls, and for social functions such as dinners. So called because it was the gathering place for troops in the First World War. Huge playing fields next to the park which have hosted many large-scale annual events such as Leeds Mela, and the Love Parade. Aviation pioneer Robert Blackburn conducted test flights of his aircraft in 1909 and in 1919 established a small airport here, with flights to London and Amsterdam. There is a golf course and tennis courts, as well as the use of Soldiers' Field and the Arena for sports events. This grade II listed drinking fountain in the shape of a classical rotunda was presented to the Borough of Leeds by John Barran in 1882. Its water outlets have been removed. Its sculpture was executed by John Wormald Appleyard. The smaller of the two lakes, featuring fountains, an island and a waterfall that leads down to Waterloo lake via a ravine. It is five acres in extent, but only 3 to 4 feet deep. The Upper Lake is on much higher ground than Waterloo Lake. The Lake was once abundant with White-Clawed Crayfish (Austropotamobius pallipes) but soon started to die out, Crayfish were reintroduced and can now once again be found in the upper lake. Constructed by soldiers who had returned from the Napoleonic wars and thus named after the Battle of Waterloo. They were unemployed, so Thomas Nicholson provided work and income to landscape a former quarry. It took two years to build, has an average depth of 60 feet (18 m) deep and covers 33 acres (0.13 km2). It was originally used for boating, and for a period there were trips around it in a steamboat called the Maid of Athens (which was sunk in the lake at the end of its useful life). In 1900 this was replaced by an electric launch, the Mary Gordon, which operated until 1923. A cafe was constructed above the boathouse. The lake is now used for fishing, but not boating. The lower part ends in a dam which included a sluice and waterfall from at least 1893. By 1921, the waterfall fed a bathing pool at the bottom of the dam, but both features have since been removed, and the overflow from the lake is now by a weir at the western end of the dam. Great Heads Beck flows southward into Waterloo Lake, which it enters at its northern end. The Mansion House is a large stone two- and three-storey house in Greek Revival style with a view over the Upper Lake, built from 1811 to 1826. It was built for Thomas Nicholson and his wife Elizabeth, who took up residence in 1816. It had three carriage houses and stabling for 17 horses. It was bought by the City of Leeds in 1871, and the sale document noted that the principal rooms on the ground floor were 13 feet high, and on the first floor were 17 bedrooms and 2 water-closets. It was leased out by the Council as a hotel and restaurant, being a popular place for weddings, receptions and dances until its closure in 2004 for renovation, with a view to conversion into Council offices. This caused some controversy and opposition. In November 2007 the rear wings of the building were opened again after an £8 million refurbishment as an Education and Visitor Centre and offices for park staff. In August 2009 Leeds based Dine catering reopened the cafe and function rooms, after substantial refurbishment. ^ Only Richmond Park (London), Phoenix Park (Dublin) and Silesian Culture and Recreation Park (Chorzów, Poland) are larger. ^ a b Daily News 20 September 1872 "Prince Arthur at Roundhay Park"
^ a b Dickinson, J.; Webster, G.D. (1967). A History of St John's Church Roundhay. ^ "Divers find bodies in park lake". BBC. 23 June 2005. Retrieved 8 June 2016. ^ "Roundhay Park cafe is hit by fire". BBC News. 27 January 2007. Retrieved 6 October 2012. ^ "Cheers all round as park re-opens". Yorkshire Evening Post. Retrieved 6 October 2012. ^ "Tropical World renamed in honour of Ziffs". Yorkshire Evening Post. 24 July 2008. p. 9. Retrieved 23 April 2014. ^ "1:2500 map". Streetmap.co.uk. Retrieved 13 October 2017. ^ "The Alhambra Garden, fountains". RoundhayPark.org.uk. Retrieved 16 October 2017. ^ "The Friends of Roundhay Park". FoRP. 9 November 2005. Retrieved 6 October 2012. ^ "Friends of Roundhay Park Newsletter" (PDF). July 2006. Archived from the original (PDF) on 8 February 2012. Retrieved 23 April 2014. ^ a b "The Splendour and History of Roundhay Park". Yorkshire Reporter. 9 March 2015. Retrieved 30 August 2016. ^ Hurworth, Neville. "A Short History of Roundhay to the Twentieth Century". Archived from the original on 5 October 2015. Retrieved 5 October 2015. ^ Historic England. "Barran's Fountain (1256170)". National Heritage List for England. Retrieved 28 February 2019. ^ "The Barran drinking fountain". Leeds Times. 8 April 1882. p. 2 col6. Retrieved 19 February 2019 – via British newspaper Archive. ^ "Mary Gordon". National Historic Ships UK. Retrieved 13 October 2017. ^ "1:2500 map". Ordnance Survey. 1893. ^ "1:2500 map". Ordnance Survey. 1921. ^ "1:2500 map". Ordnance Survey. 2017. ^ Henry, John (23 April 2004). "Mansion conversion sparks anger". BBC News. Retrieved 6 October 2012. ^ Ginley, Joanne (23 November 2007). "Park centre shows £8m new face". Yorkshire Post. Retrieved 23 April 2014. ^ "Latest developments". Roundhay Today. Archived from the original on 8 June 2009. Retrieved 9 April 2008. ^ "Slideshow: Rolling Stones at Roundhay Park 1982 – Top Stories – Yorkshire Evening Post". Roundhay Today. 30 August 2007. Retrieved 6 October 2012. 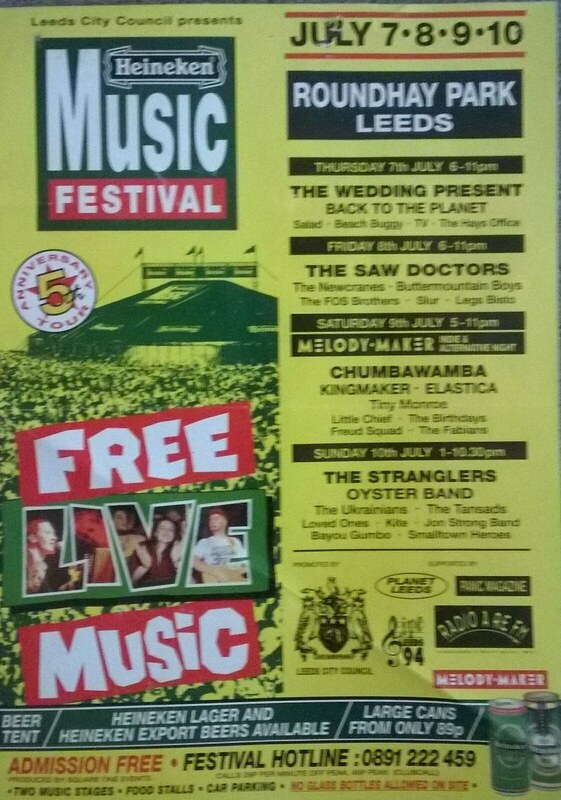 ^ "UK Free and Commercial Festival list :1983". Ukrockfestivals.com. Retrieved 6 October 2012. ^ "Bruce Springsteen Roundhay Park, Leeds 1985". YouTube. Retrieved 6 October 2012. ^ "Genesis — Leeds — Roundhay Park". Songkick. 28 June 1987. Retrieved 6 October 2012. ^ "Slideshow: Madonna at Roundhay Park, 1987". Roundhay Today. 26 November 2008. Archived from the original on 21 April 2013. Retrieved 6 October 2012. ^ "Slideshow: Michael Jackson at Roundhay Park 1988". Roundhay Today. 8 August 2007. Retrieved 6 October 2012. ^ "Roundhay Park, UK". Simplemindslive.com. 23 July 1989. Retrieved 6 October 2012. ^ "Genesis at Roundhay Park". Songkick. 31 July 1992. Retrieved 6 October 2012. ^ "Michael Jackson Dangerous Tour Dates". Michael-jackson-trader.com. Retrieved 6 October 2012. ^ "U2 on tour". U2gigs.com. Retrieved 6 October 2012. ^ "Festivals from 1992–96". Myweb.tiscali.co.uk. Retrieved 6 October 2012. ^ "Festival poster". The Nostalgia Shop. Retrieved 13 October 2017. ^ "Radio 1 – Love Parade". BBC. Retrieved 6 October 2012. ^ "Close Encounters Tour". RobbieWilliams.com. Retrieved 6 October 2012. Wikimedia Commons has media related to Roundhay Park. This page was last edited on 28 February 2019, at 19:02 (UTC).